Digital Marketing – What’s it all About?? Well that’s a hard question to answer as digital marketing is evolving at such a rapid pace that it’s hard to imagine what the next 5 years will bring let alone the next 50 years. 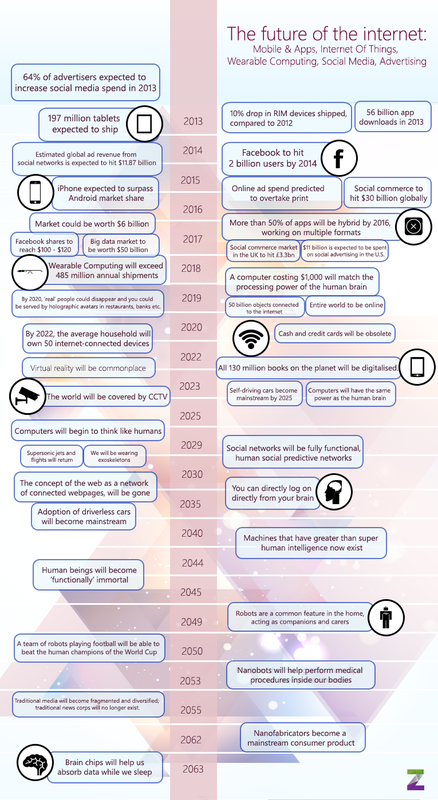 SimplyZesty recently compiled an info graphic timeline of some of the predictions of what lies ahead for digital marketing. So let’s take a set back and define digital marketing and how it is used. According to Rob Stokes and the Minds of Quirk, ” digital marketing drives the creation of demand using the power of the internet. The internet is an interactive medium. It allows for the exchange of currency, but more than that, it allows for the exchange of value.” While Wikipedia define it as “marketing that uses electronic devices such as computers, tablets, smartphones, game consoles etc. to engage with consumers and other businesses”. It can take two different forms know as push and pull marketing. Push is when you actively seek information on a brand product for example signing up online for your newsletter such as Groupon or when you search for a brand online. Have you ever receive emails and thought hang on a second I didn’t sign up to receive this??!! To you this as spam but in the digital marketing world this is known as Push marketing. The brand is hoping that they will attract your custom as your may fall into their current target audience. Push marketing can also be in the form of a display ad on a website, Google ad words campaign and blogs. With any marketing campaign it is key to know what your objectives are, who is your target audience is and how your are going to reach them. This will form the basis of digital marketing strategy. Facebook, Twitter, Pinterest, LinkedIn, Google Ad words etc. will then be the tools/channels use to get your message across. Every digital marketing strategy must be measurable and have clearly defined KPIs.